THE GHOST AHOLICS CREW ARE based on the belief that our customers' needs are of the utmost importance. Our entire Ghostly paranormal team is committed to meeting those needs. As a result, a high percentage of our business comes from repeat customers and referrals. You will enjoy your Ghostly experience, we will make it unforgettable. We want you to return year after year. We would welcome the opportunity to earn your trust and deliver you the best Paranormal Experience in the industry. Our Paranormal Team has their own reality TV show on streaming TV with over 30 episodes and climbing, they have been ghost hunting for over 18 years with a combined total of over 60 years experience. They have become well known all over the US and the world via their International reality TV show. Our team consist of Law Enforcement investigators, a true Psychic by birth, Paranormal Spiritualist/Ordained Minister, Metaphysical instructor, and Technicians. The Ghost Aholics Crew are also Celebrity Horror Movie Actors with 2 Horror Movies Released to Date and 2 more on the way, You will be conducting Intense Paranormal Investigations with Celebrities JB ,Denny and Deb! You will not be disappointed. ***ALL NEW- 120 ACRES PLUS OF HAUNTED CIVIL WAR & NATIVE AMERICAN LAND EXCLUSIVE TO JUST THE GHOST AHOLICS CREW! PROPERTY IS MARKED NO TRESPASSING, YOU MUST CALL US TO GET YOUR TICKETS FOR ENTRY! WE ARE THE ONLY TEAM ALLOWED TO INVESTIGATE ON THIS CRAZY 120 ACRE HAUNTED PROPERTY! NO WAITING, NO GHOST WALK OR TOUR, THIS IS REAL, WE TAKE LIMITED GUEST! *PRIVATE CIVIL WAR COVERED BRIDGE! I MEAN PRIVATE AND HAUNTED! PLENTY OF SOLDIERS AND OTHER ENTITIES WILL COME RIGHT UP TO YOU, TALK WITH YOU IN THE WHITE NOISE AND MORE! *PRIVATE ABANDONED 13,000 SQUARE FOOT TRULY HAUNTED MANOR HOUSE! PLENTY OF GHOST IN THIS HOUSE, CAUGHT ON FILM, SEEN BY GUEST AND THE GHOST AHOLICS CREW! SPEAK WITH THESE GHOST THROUGH THE WHITE NOISE! *80 ACRES OF HAUNTED WOODS AND TRAILS WHERE NATIVE AMERICANS AND CIVIL WAR SOLDIERS SPIRITS HAVE BEEN SEEN AND DETECTED! A WHOLE PLATOON OF SOLDIERS WAS SEEN LAST YEAR IN THE WOODS AS WELL AS NATIVE AMERICANS AND MORE! 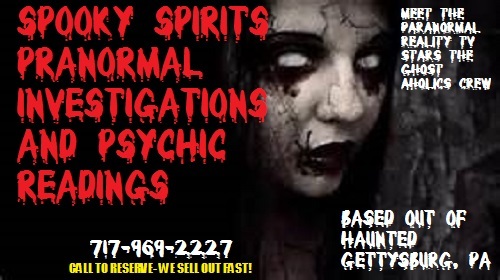 *TRULY HAUNTED AMUSEMENT AREA THAT HAS PLENTY OF APPARITIONS FOR YOU TO CAPTURE ON FILM OR TALK THROUGH THE WHITE NOISE! *HAUNTED SLEEP OVERS, HAUNTED CAMPING AND MORE TO COME FOR THIS SEASON! GET IN NOW! THESE LOCATIONS ARE TRULY HAUNTED AND OFFER YOU A DIFFERENT EXPERIENCE, AND ALSO THE CHANCE TO INVESTIGATE WITH THE TV SENSATIONS GHOST AHOLICS CREW, OR INVESTIGATE ON YOUR OWN WITH ONE OF OUR INVESTIGATORS STANDING BY! THIS AREA IS HUGE AND HAUNTED AND EXCLUSIVE ONLY TO THE GHOST AHOLICS CREW! MORE COMING! "THERE ARE NO SETS, THERE ARE NO SCRIPTS, THIS IS REAL"
Paranormal Investigations by the Paranormal Reality TV stars the Ghost Aholics Crew, Celebrity Psychic Witch Madam Della- True psychic Readings, NO Tarot cards ever.